With the support of The Getty Foundation as part of its Digital Art History initiative, The Wired! 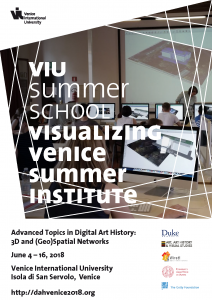 Lab for Digital Art History & Visual Culture at Duke University, the University of Padua’s Architecture and Engineering program and Venice International University are collaborating on a Summer Workshop that will support interdisciplinary teams focused on the hard questions of Digital Art History as a discipline, a set of methods, and a host of technical and institutional challenges and opportunities. After five editions of two-weeks summer workshops introducing concepts and methods for digital art and architectural history through hands-on tutorials and collaborative project development, the program for 2018 will shift to focus on advancing the field of digital art and architectural history through a combination of project-sharing, technology exploration, and academic discussion. After the initial two-week gathering in Venice, we still stay in touch as a community over the course of the next year, reconvening for one week in 2019 to write up and assess our work. This workshop is different than our earlier Visualizing Venice workshop iterations in that we are asking people to apply as teams of 2 or 3, and with a Digital Art History Mapping and/or Modeling project already in place, and which they hope to develop further in conversation with the group. The focus of applicant projects does not need to be on Venice or Visualizing Cities, though projects related to those themes are welcome. We will expect participants to share their working projects files with the group, and will work with selected participating teams in advance of the meeting to customize the curriculum to fit the needs and interests of the group. Alums of our previous introductory workshops are welcome to apply, as are new participants, from the US and abroad. Thanks to the generosity of the Getty Foundation, we are able to offer support for tuition, travel, board and accommodation expenses. 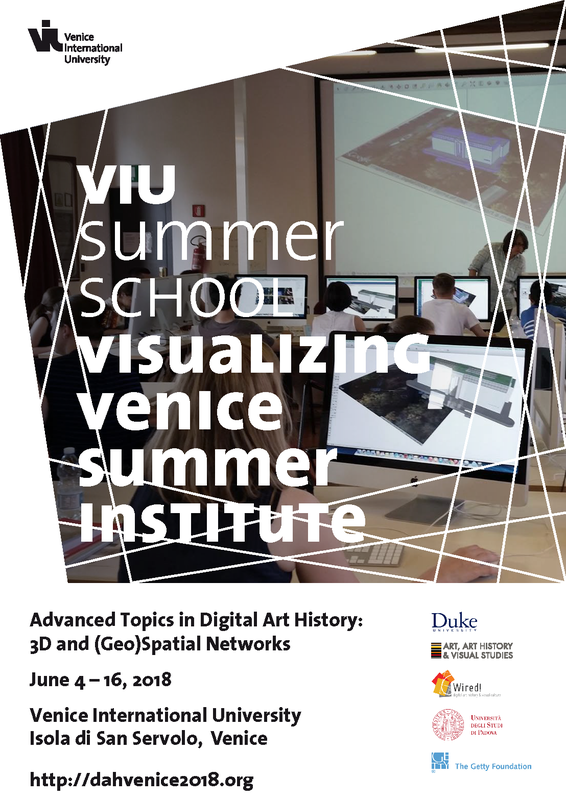 More Info and Application at http://univiu.org/homepage/study/summer-schools/visualizing-venice.